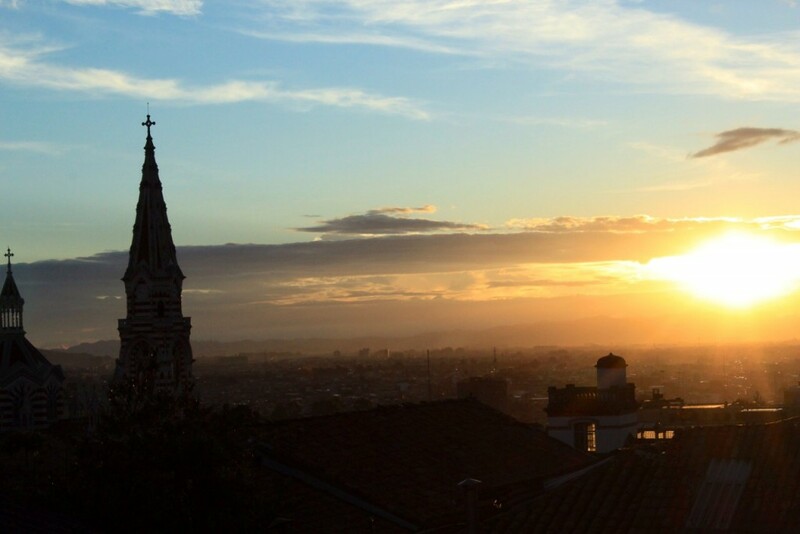 Sunset over Bogotá, Colombia. From La Candelaria. As I have mentioned previously, I met with officials from Colombia’s Finance Ministry during my trip to the country in March. While the focus of our meeting was on the fundamentals of the Colombian economy, I was keen to learn more about the specifics of Colombia as a place to invest and the resources available for an Irish company/investor who would like to explore opportunities in the region. On this front, they kindly put me in touch with PROCOLOMBIA, the agency responsible for promoting foreign investment in Colombia. I spoke with Andes Sarmiento, their Investment Specialist based in London, to learn more about what the country has to offer and how ProColombia can assist Irish investors and Irish companies looking to explore opportunities in Colombia, but also as a gateway into the relatively untapped Latin American market. After speaking to Andres, I found him to be very insightful and my impression is that this is an organisation which has weight behind it. Always looking to bring new insights to readers of my blog, I am sharing an interview I did with Andres. At best, it might provoke some interest among Irish companies or investors looking to explore new markets. At worst, you will learn more about Colombia, a country that has certainly piqued my interest, and tempted me to explore Latin America further, a move I might one day make before I get too old. My first step, learn Spanish! Also, remember that anyone invested in “Emerging Markets”, for example via the MSCI Emerging Markets Index, of which almost all pension and investment portfolios now have an allocation, will be invested in Colombian equities. Andres, thanks for your time. Could you outline briefly who ProColombia are and what you do? PROCOLOMBIA is the entity that promotes international foreign investment, non-traditional exports in Colombia, tourism and country brand. As the investment specialist, I’m focused on the FDI attraction from Ireland, UK and Scandinavian countries to Colombia. With this effort I am attracting multi sector direct investment but with more emphasis on investment that generates quality employment and export opportunities. It doesn’t matter if an investor is looking at opportunities in different sectors such as manufacturing, services, infrastructure or logistics, in ProColombia we will be happy to give advice and facilitate the identification of opportunities in Colombia. When considering investment opportunities, we tend to talk about emerging markets as one homogenous group. However, the reality is that this wide encompassing term includes many different countries with unique characteristics. What do you believe differentiates Colombia as a place to invest? You are right, this is not only the case for emerging markets but also, when it comes to exploring opportunities in more developed countries, you need to look at every investment opportunity on a country by country basis. I would like to start with the very basic statistics, Colombia has 49 million inhabitants, making it the second largest Spanish speaking country in the world. We are strategically located in the centre of the Americas with access to both the Atlantic and Pacific oceans and less than 6 hours away by airplane from the main cities in the continent. Along those lines, we have access to 47 countries and more than 1.5 billion consumers through our network of trade agreements. Colombia has many other differentiating factors; in economic terms we have been outperforming the region for the last 3 years and in 2016, when the region is expected to grow at negative levels, Colombia is forecasted by the IMF to grow by roughly 3%. The effects of this economic performance are evident in many other factors that differentiate Colombia as a good place to invest. For example, our middle class is expanding at a very high rate. In 2002 16% of the population were the middle class, in 2012 this rose to 25% and by 2025 it is expected to increase to 46%. In July 2014, Moody´s was the last rating agency in improving Colombia´s credit rating and, similar to others, argued: The positive growth forecast will continue in the future, thanks to 4G infrastructure and the sound fiscal management that will continue in the future. I think these are some example factors that differentiate us. I welcome you to invite new investors so we can advise them on specific opportunities. How difficult is it to establish a business in Colombia. Initial impressions from people I talk to would be concern over bureaucracy and cultural differences. Is this misguided? How does ProColombia specifically help Irish companies looking to establish links in Colombia? Establishing a business in Colombia shouldn’t take you more than 30 days in total. This period includes the company registration at the local chamber of commerce (the equivalent to Companies House) and it comprises getting a bank account that any business would need in order to operate within the country. If you have the correct documentation, advice and procedure knowledge, there should be no issues with establishing a business. Cultural differences are inevitable but investors will encounter them no matter where they are going, I can assure you that Colombia has a mature business culture that will enable business development in the country. The Colombian government has made a big effort in the last decade to facilitate the ease of business activities and reduce bureaucracy. Very little trade is done between Ireland and Colombia, but it appears Latin America in general remains a relatively untapped region for Irish companies. What makes Colombia an attractive destination for companies looking for a gateway to this region, which comprises over 600 million people? As I mentioned before, Colombia clearly offers the right potential to Irish companies that want to invest, use Colombia as a gateway to Latin America and explore the country. However, let me focus on our strategy to increase Colombian exports to Ireland and what we are doing. We have identified that Colombia has agribusiness opportunities in Ireland, especially in fresh fruits – such as avocado and pineapple, Specialty Coffee and cut flowers; along with the apparel sector in swimwear, shapewear and baby clothes. Although some of the Colombian products enter the Irish market through the UK, we are beginning to start work on selling and promoting Colombia more directly to Irish companies that want to have a direct contact with the source; we have seen these examples in cut flowers, fruits and coffee. Would you be able to provide any examples of investment opportunities you have assisted a foreign investor with and is there any Irish company you can mention where you have assisted in their expansion into Colombia? We have assisted a large amount of diverse foreign investors, from different countries to invest in Colombia. These investments have gone to many different sectors, ranging from foods and beverages, IT consultancy, BPO companies, corrugated and plastic packaging, civil infrastructure, energy, etc. Of course Irish companies are not the exception and many of them are already present and expanding in Colombia. Smurfit Kappa is a good example of a company ProColombia has been supporting and facilitating in growth, helping them to establish a long lasting and growing relationship with Colombia. At the moment we are working with many different companies that are looking at opportunities in the country, some of which are from Ireland, but as you might understand, these processes are confidential. We recently supported Endava, the privately owned IT services company to open offices in Colombia. We expect them to have a consolidated presence in the country of 200+ employees in the next 2 years. You mentioned you worked in the energy ministry prior to joining ProColombia. I found it interesting to learn just how advanced Colombia’s energy sector is. Can you elaborate on this and how it has helped attract foreign direct investment? According to the Global Energy Architecture Performance Index made by the World Economic Forum, Colombia has one of the most sophisticated and reliable energy architectures in the world. In the general ranking we are positioned 9th out of more than 125 countries. It is worth mentioning that Colombia’s installed electric generation capacity is very clean thanks to its 70% hydropower share, 29% thermal power and 1% coming from other types of generation. When it comes to the energy sector, Colombia has developed some very strong national players that after having consolidated their presence in the Colombian market have started growing around Latin America. Some of these companies are ISA, Isagen, EPM and EEB. On the oil and gas sector we have Ecopetrol, the national oil company that has presence in different countries as well. Additionally major international power companies like AES, Emgesa and Enel amongst others, are present in the electricity sector in Colombia. On this point it is worth mentioning that major international oil companies like Shell, Chevron, Petrobras, Glencore, Anadarko, etc. are operating in Colombia. Colombia is best known for being an oil producing country but I have read the county is also rich in renewable energy resources. One World Bank report noted that wind potential alone could cover the country’s total energy needs. What incentives have been put in place to develop the sector? Colombia is indeed very rich in renewable energy resources. The best way to see how we are exploiting this potential is by looking at how clean our installed electric generation capacity is thanks to its 70% hydropower share, 29% thermal power (mainly gas and some coal) and 1% of other type of generation. As mentioned in the previous question. We are aware of the non-conventional renewable energies potential that we have, and because of it, we are expanding our generation capacity and relying on modern techniques to do so. Along with our expansion we are providing incentives to further increase its renewability. The Law 1715 of 2014 seeks the integration of non-conventional renewable energy (like wind and solar) to the national energy system. This law promotes the development and use of these types of sources to the national energy grid, establishing legal frameworks and instruments for its use and creating tax incentives for investments in these kinds of projects. Some of the specific tax incentives are 50% deduction of investments from the income tax for five years, accelerated depreciation of the equipment, value-added tax (VAT) exemption on the equipment for the projects and exemption from duties. Clearly, the plunge in oil prices was a reminder of the importance of having a diversified economy. What other sectors is the government prioritising to make more of a contribution as the economy develops over the next ten years? When oil and gas revenues started falling, Colombia was already putting in place a diversification program that has proved quite successful and has enabled the attraction of investment into different sectors other than mining, oil and gas. For example, in 2010 investment to those sectors accounted for 77% of total Foreign Direct Investment while in 2015 their share was below 26%. The sectors that have experienced an important growth and that are getting significant amounts of FDI during the last years are manufacturing, hospitality and commerce, and financial services. It is worth highlighting that as the manufacturing sector is associated to the strengthening and generation of new export capabilities, the country has put a lot of effort into promoting and putting the right incentives in place to attract these types of investments. IT and outsourcing services are also sectors where we have put a special emphasis as we know that they will create good quality jobs, there is a large growth potential and the right human labour availability in the country. One simple but sound statistic; by 2018 Colombia seeks to double non-traditional exports. We want to increase our non-mining and non-energy goods and services exports from the US$16 billion, we had in 2015, to US$30 billion. The sectors prioritised from ProColombia in the United Kingdom are 1) manufacturing: mainly plastic packaging and basic chemicals, 2) Services: IT, digital content and fin-tech, 3) Agribusiness and 4) Infrastructure and logistics. At my meeting with officials from the Colombian Finance ministry in March we discussed the prospect of a peace deal being agreed with FARC and what that might mean for Colombia. Beyond the obvious human benefit, an end to violence, it would open up a significant part of Colombia for development, which has been relatively closed. What are your thoughts on how the peace deal will help Colombia? In terms of investment opportunities, is the first stage targeting infrastructure investment? I can only think of positive consequences for Colombia regarding the peace agreement with FARC. Socially, economically, politically and culturally it can only improve and as a result we will be able to generate more opportunities in regions that are ready to further develop. Colombia has already put in place the largest infrastructure plan of its history. In 2012 we launched the US$20 billion plan that will close a gap we had with some other countries in the region. This strategy includes the intervention of more than 2,800km of roads around the country. We have talked a lot about what makes Colombia an exciting place to invest in, for investors to be part of the continued development. However, as with everything there are also challenges to be faced. What do you think are the biggest challenges to Colombia reaching the next stage of development? Are the biggest risks external or domestic? One year ago I would have highlighted the dip in the oil prices as one of the main challenges for Colombia’s economy; however, during 2016 we have seen that the Colombian economy proved to be strong and resilient. On its April 2016 forecast update, the IMF stated that the Colombian economy is expected to grow 3% this year while the region would grow at negative levels. This being said, there is still a mid-term challenge with regards to the current account deficit, which central bank board member Carlos Gustavo Cano has called the Achilles heel of the economy, and is forecasted to end 2016 between 6-7% of gross domestic product. This government has had an important strategy towards reducing inequality and impacting, with sound economic policy, underprivileged socioeconomic groups. However, inequality in Latin America, and of course Colombia, is still as a big challenge. I have no doubt that with the post conflict process we will be able to tackle it in a more direct and effective way. Finally, an off topic question. I am interested to know if the popularity of the Netflix series “Narcos” – which documents the rise and fall of Pablo Escobar and the Medellin Cartel – has hindered or helped you in promoting Colombia. On the one hand it might reinforce misperceptions of what Colombia is like today, but on the other hand it shows some of the amazing Colombian scenery and maybe forces people to learn more about the country? It is quite evidently a sensitive topic for the country. It has certainly not been our approach to take advantage of its popularity in order to promote Colombia, indeed we have tried to leave it in the past and start a new page. However, it is also true that this form of media significantly increases the visibility of our country. As it has the ability to spread and catch people’s attention in an immediate way. If, by doing this, it is able to trigger an interest in its audience that is deep enough to motivate them to know more about the country they might unveil a whole new positive side that could change their perception. Otherwise it would just add to the stereotype. In other words it depends on the knowledge base of the viewer and the ability of the story to create curiosity. It might have increased visibility but at a price. Andrés is an Investment Specialist at ProColombia. He is responsible for the promotion of Colombia as a Foreign Direct Investment destination. Before joining this agency he worked with the Minister of Mines and Energy of Colombia where he led the discussions between public and private sectors to increase the competitiveness of the oil & gas and mining contracts. Additionally, he participated on the institutional restructuring of state entities related to energy and mining activities. He served as a board of directors’ member in Cedelca electric company in Colombia. Andres was born in Bogotá and is an economist from the University of Los Andes with a Master’s degree in economic sciences and holds an MSc in Metals and Energy Finance from Imperial College.